Hats and Rabbits: Amelia Rose Earhart: Why Aren't We Watching? Amelia Rose Earhart is, right now, up in the sky, following the flight of the famous woman who disappeared in 1937. It turns out they are not related. The current Amelia admitted that she once thought they were, but found out recently that they are not. 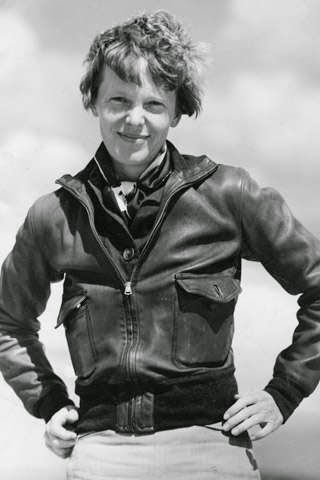 Still, Amelia Mary Earhart was the current Amelia's namesake. How is this not all over the Internet? I mean, you can find it, but... Jeeze. How am I one of the few people who thinks this is really cool? I saw one oaf on a site call her another "blond, rich woman with nothing better to do." Ellen DeGeneres did a skit and made fun of her. I want to draw all sorts of conclusion about a loss of wonder; about a world too wrapped up in turmoil to be interested in one woman's derring-do. Or, is it that news that is not about dad's locking their kids up in hot cars to die and injured children kicked out of fast food restaurants because of facial injuries is not interesting to us anymore. Are we so driven by reality and by schadenfreude that we can't enjoy a cool, nostalgic adventure story? Well, I'm watching, because I think it is awesome that she has the guts and sense of nostalgia to do this. I still love history and I still think it is worth it to sometimes do the unnecessary and the extravagant and the theatrical. How many truck drivers named William Clark cross the continent every week, and how much publicity do they get? The advances in technology, particularly in navigation, make this woman's travels a lot less chancy. Yes, airplanes do fall out of the sky still. But trucks are wrecked too. Hi, George. Yeah, I know. But I still think it is cool enough to at least pop up on Yahoo news... Just for nostalgia's sake.